Ashley Schuh, 14, of Wapakoneta, gets a hug from her coach Ty Batty, of Ann Arbor, Mich., as she accepts her ring during a team ring presentation ceremony at the United Tumbling Academy Sunday, Aug. 26. 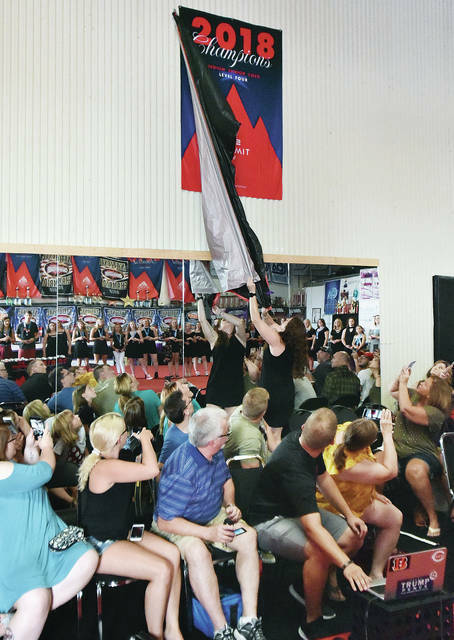 Abbey Kramer unveils the 2018 national championship banner Sunday, Aug. 26, at United Tumbling Academy’s ring ceremony. SIDNEY — A dream full filled. That’s how members and coaches at United Tumbling Academy’s co-ed competition cheer team, the United All Starts Venom, feel about the national championship title they captured in May. The team was honored Sunday with the a ring ceremony in which they each received a national championship ring. The team won the D-2 Summit competition in May at Walt Disney World Resort’s ESPN Wide World of Sports. There were 30,000 athletes competing at the event, said Kramer. They represented 44 states and 11 countries. The team, said Kramer, competes at level 4, which is the difficulty of the routine. For the tumbling requirements of the level the team can do layouts, whips, standing tucks, standing back handstands, standing back handstands to whips and layouts. “There’s no twisting in level 4 tumbling,” said Kramer. For stunting, the team can do extended 1 legged stunts and double twisting skills. “Their routine was 2 minutes and 30 seconds long,” said Kramer. Once at the Florida competition, the team moved past the Friday preliminaries and only competed on Saturday and Sunday. “Because we were one of the top seven teams from the other competitions, we didn’t have to compete on Friday,” said Kramer. After the Saturday competition, the team was in first place, said Kramer. Kramer said the team goes to eight to 10 competition during the year. The team’s season starts in June and ends with the national competition in May. “The team worked well together this year,” said Kramer. “Some knew each other from cheering (high school) and others met at other gyms. The team consists of 28 members, said Kramer. Due to injuries and schedule conflicts, a few former members were asked to fill in for the final few meets of the year. One of the former team members who competed in Florida was Olivia Pulfer, 19, of Lima. The daughter of George and Carlotta Pulfer has been competing for 13 years. She is currently a student at Wright State University, Dayton, and is on their cheerleading squad. Pulfer, who cheered for Shawnee High School, said she competed with the team as a “super senior” for the last two competitions. “I’d like to thank Abbey and everyone at United for everything they’ve done for me,” said Pulfer. Two other seniors on the tam were Kyle Bruce, 18, of Celina, and Julia Hutchins, 18, of Lima. Bruce is the son of Amanda Bruce and Noel Bruce. He’s been competing for 10 years. Hutchins is the daughter of Amy an Dave Hutchins and also has been competing for 10 years. She also cheered for Shawnee High School and is currently enrolled in the University of Findlay. Hutchins said competitive cheer is very different from high school cheerleading. “We are a family here (United Tumbling Academy),” said Hutchins. “There’s a real support system for us. Winning the national title meant everything to him. “This was what I’ve dreamed about doing when I first started cheering,” said Bruce, who will be back to compete this year. “I had a lot of nerves before the Sunday competition. The top spot can always be taken from you. “I wouldn’t have had this opportunity if not for Abbey and United Tumbling Academy,” said Bruce. In addition to Kramer, there are three other coaches for the team. They are Kirsten Barger, of Anna, Breanna Graham, of Shawnee, and Ty Batty, of Versailles. During the ring ceremony, each coach talked about the team members. Graham told the team she was proud of them. Batty knew the team was going places in January. Kramer added final comments to Sunday’s presentation. “I’ve enjoyed watching you grow and develop into the young men and women that you are,” said Kramer. “Our coaches have been great mentors to you. Kramer said the team has also taught her a lot this year too. “Thank you parents for letting us do this,” said Kramer. Members of the national winning cheer team are Taylor Bechtel, Lima; Jazmin Boatman, Sidney; Elly Bruce, Celina; Kyle Bruce, Celina; Brylie Casiano, Sidney; Kaleigh Clark, Lima; Olivia Clark, Lima; Kameryn Cline, Celina; Marisssa Daley, Lima; Brielle Dirmeyer, Van Wert; Alexa Fisher, Lima; Emma Freewalt, St. Marys; Kami Harris, Sidney; Julia Hutchins, Lima; Ashley Langenkamp, Coldwater; Alexa Lyons, Lima; Sierra Maxwell, Celina; Sarah Miu, Sidney; Chloey Nelson, St. Marys; Mattie Okief, Lima; Mckenna Okief, Lima; Camden Pauff, Lima; Olivia Pulfer, Lima; Becca Rindler, Maria Stein; Ashley Schuh, Wapakoneta; Alex Spicer, Wapakoneta; Makayla Stangel, Sidney; and Amber Townsend, Sidney. https://www.sidneydailynews.com/wp-content/uploads/sites/47/2018/08/web1_SDN082718Ring2.jpgAshley Schuh, 14, of Wapakoneta, gets a hug from her coach Ty Batty, of Ann Arbor, Mich., as she accepts her ring during a team ring presentation ceremony at the United Tumbling Academy Sunday, Aug. 26.
https://www.sidneydailynews.com/wp-content/uploads/sites/47/2018/08/web1_SDN082918Champs.jpgAbbey Kramer unveils the 2018 national championship banner Sunday, Aug. 26, at United Tumbling Academy’s ring ceremony.